When a new solar system body is discovered, clues to the astrological meaning comes primarily from studying the planet in a large number of charts to find common themes. This book is an attempt to do this for Sedna. Drawing on two years of research, New Zealand astrologer, Alan Clay, calls it ‘the soul’s path of destiny’. Many astrologers believe that each new planet discovered represents a new aspect or level of consciousness that humanity starts to embrace from that moment and, if this is true, Sedna represents the weird new outer limit of our consciousness which is stretching our concepts of reality and is pulling us to look at ourselves as part of the very big picture. To understand Sedna, the book also looks at the physical characteristics of the planet, at the myth behind the name and at past cycles, finding a connection with the Ice Age cycle and with evolutionary changes on Earth. It also looks at discovery events in 2003 and finds a link with the emergence of neural networks, which is the basis for Artificial Intelligence and with Dark Energy and Dark Matter, which together make up 95% of the universe… that’s right, Sedna teaches us that we’ve only discovered 5% of what is really around us. Then we look at Sedna in the signs and the houses and at the aspects with all the inner planets, so you can begin to interpret this evolutionary planet in your own life. The book includes a comprehensive aspect analysis with all the traditional planets, plus all the new dwarf planets including: Ceres, Pluto, Ixion, Orcus, Makemake, Haumea, Varuna, Quaoar and Eris. This book will be launched at the United Astrology Conference in Chicago in May. Find it in booth P35 by the bookshop. Alan is also giving a series of talks on Sedna to NCGR groups across America in May and June and later in the year he will be lecturing at the Astrological Lodge in London and the State of the Art Astrology Conference in New York as well as to astrology groups in Canada, Australia and New Zealand. Email alan@artmedia.net.nz if you would like to invite him to speak to your group. 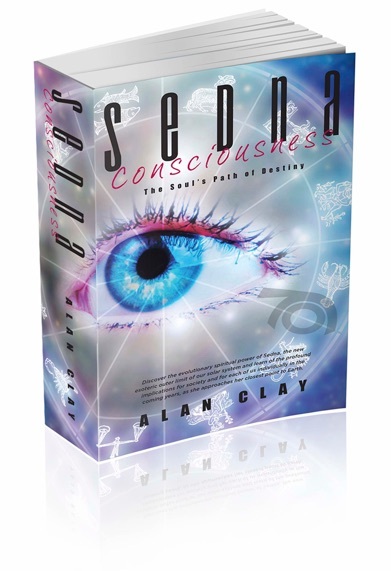 Alan Clay draws the connection between Sedna and the centaur, Pholus, because they both have a 'space weathering' process that turns the surface of each red, so they both have to do with growth and illumination. And he links it with Ceres, because they both likely have internal oceans, so they both speak of a nurturing process. And with Saturn, because their daily rate of spin is the same, so they have the same day to day practical perspective and both speak of limits.